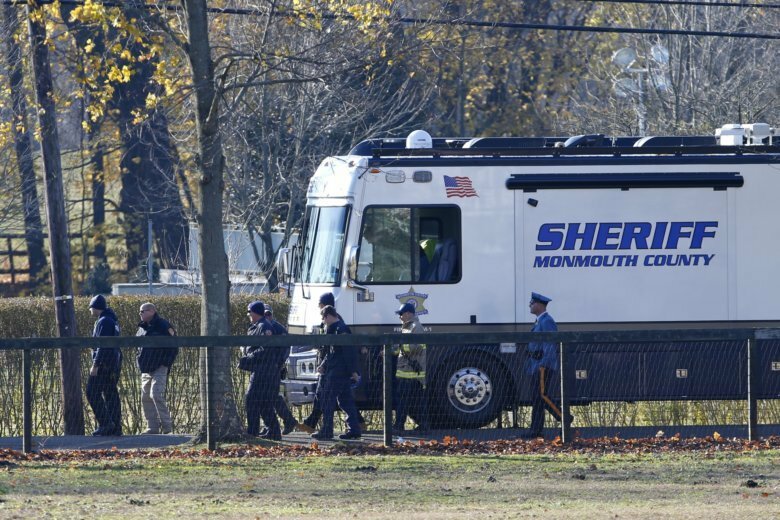 COLTS NECK, N.J. (AP) — In some versions of a story Nov. 21 about the death of a family of four, The Associated Press misspelled the last name of a man charged with setting fire to his own home. He is Paul Caneiro, not Caniero. Additionally, the last name of one of the dead family members was misspelled. She is Jennifer Caneiro, not Jennifer Caniero. Residents in a New Jersey community have come together to mourn the loss of four family members who authorities determined were killed before their home was set ablaze. Prosecutors have reassured the public that a killer is not on the loose in connection with the New Jersey mansion fire that is now an arson and quadruple-homicide investigation. The brother of the man found shot to death on the lawn of the burned Colts Neck house has been charged with aggravated arson in a different house fire that happened hours before the mansion blaze. But the Monmouth County prosecutor said Wednesday afternoon that he could neither confirm nor deny that the brother, Paul Caneiro, was a suspect in the slayings of Keith Caneiro, his wife, Jennifer Caneiro, or their two children. Paul Caneiro is accused of setting fire to his own Ocean Township home, about seven hours before the mansion fire was reported. It was not immediately known if he had retained an attorney. Prosecutors say the four people found dead at the scene of a New Jersey mansion fire have been identified as a husband and wife and their two children, and each were victims of “homicidal violence” before the blaze was intentionally set. Monmouth County Prosecutor Christopher Gramiccioni says Keith Caneiro was found shot outside the Colts Neck mansion. The others were found inside the burning home Tuesday. He says he can’t say if the other three were also shot. They were severely burned, making examination difficult. The developments came hours after Caneiro’s brother, Paul Caneiro, was charged with aggravated arson. He’s accused of setting fire to his own Ocean Township home, about seven hours before the mansion fire was reported. No attorney information is available. Gramiccioni says the Caneiros worked together at a technology business. Authorities have arrested the brother of the man that records show owned the New Jersey mansion where two adults and two children were found dead following a fire. The Monmouth County prosecutor on Wednesday charged Paul Caneiro with aggravated arson. He’s accused of setting fire to his own home in Ocean Township. That fire took place early Tuesday morning before authorities responded to a blaze at the Colts Neck mansion owned by Caneiro’s brother Keith and Keith’s wife, Jennifer. Authorities believe that fire was intentionally set. They were awaiting autopsy results to determine how the four people died and to identify them. Paul Caneiro and Keith Caneiro are listed as executives at a technology firm, Square One. The prosecutor expects to release more details later Wednesday. Attorney information for Caneiro was not immediately available. Authorities in New Jersey continue to investigate the scene of a mansion fire believed to have been set intentionally where two adults and two children have been found dead. The Monmouth County prosecutor’s office says the fire Tuesday at a mansion in the upscale town of Colts Neck may be connected to another fire about 10 miles (16 kilometers) away in Ocean Township. The victims’ names haven’t been officially released. But property records show the 5,700-square-foot (529-square-meter) home where the bodies were found is owned by Keith and Jennifer Caneiro. The second fire occurred at a home listed under the name Paul Caneiro.